One of our customers that has been working with us for a long time, since the early 1990's in fact, also happens to be one of our largest and well-known customers. Paul Mitchell Schools has been featured in the news and magazines more times than even we can remember. Chances are if you walk into a Paul Mitchell Signature Salon or School, you have seen one of their many magazine features hanging on the wall mounted in a genuine In The News plaque. 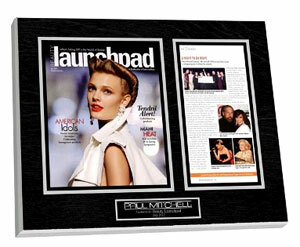 The Paul Mitchell School was nationally recognized in the July 2012 issue of Beauty Launchpad. Not only have the schools been featured in these magazines but many times the students themselves have been featured. When a student from Paul Mitchell Schools finishes and starts their own salon it is known as a Paul Mitchell Signature Salon. These stylists have been recognized in magazines for everything from their techniques and innovations to the décor of their salons. Here at In The News we have helped over 200 individuals from the Paul Mitchell School prominently display their recognition in magazines across the country. We are very proud of everyone’s at Paul Mitchell School’s success and hope it continues indefinitely, and we will be ready and waiting for the next round of magazine issues, in which we are sure to see another Paul Mitchell student’s story.